Support. It’s one word and two syllables. It has five consonants and two vowels; it’s a word you can easily sound out. It has no fancy tricks, no accents and is nothing special. Yet support is the difference between success and failure, just ask 2011 Scrapper Bryson Myles. Myles, a Texan by birth, can’t remember a time when he and his brother Candon weren’t playing sports. Originally favoring basketball and football, they only played baseball at their parents urging. “Our parents didn’t want us sitting around at home, so they threw us in baseball just to keep us occupied. It was one of those things we were pretty good at, so it became a sport we played every year”. Myles is being modest, as for most of us “pretty good” is how we describe the kid who always get’s picked first in gym class. It’s not the description of a future professional baseball player. Recruited by schools such as Texas Christian University for football, Myles had a decision to make: did his future lie on the diamond or the gridiron? He went on to play baseball at Weatherford College (Texas) and Stephen F. Austin University (Texas) before getting drafted in the 6th round of the 2011 Major League Baseball First Year Player Draft. After signing with the Cleveland Indians he was sent to Mahoning Valley to start his professional career. “It was the craziest time of my life. I don’t think at the time I realize how much work goes into the day to day of playing baseball. I don’t think I really knew how to learn at that point, I was always so good. Most of my learning about myself and baseball I did in Mahoning Valley”. Myles went from playing three to five games a week only a few hours from home to playing everyday thousands of miles from Grand Prairie, Texas. He had to adjust from BBCOR bats to wood while playing with and against some of the best talent in the country. So how did the 2011 New York-Penn League All-Star get through the struggles of learning in his first year of professional baseball? With the help of “one of the best fan bases” he’s ever been around. What Myles feels speaks volumes about Scrappers fans is that their support didn’t stop when he left the team. “In Carolina this past season there were fans from Mahoning Valley that would drive all the way just to come and watch us play”. For a twenty-four year old top prospect navigating his way through the Indians’ Farm System, a friendly face can mean more then you will ever know. Myles was especially touched by the warm welcome his brother Candon received here in Mahoning Valley this past year. 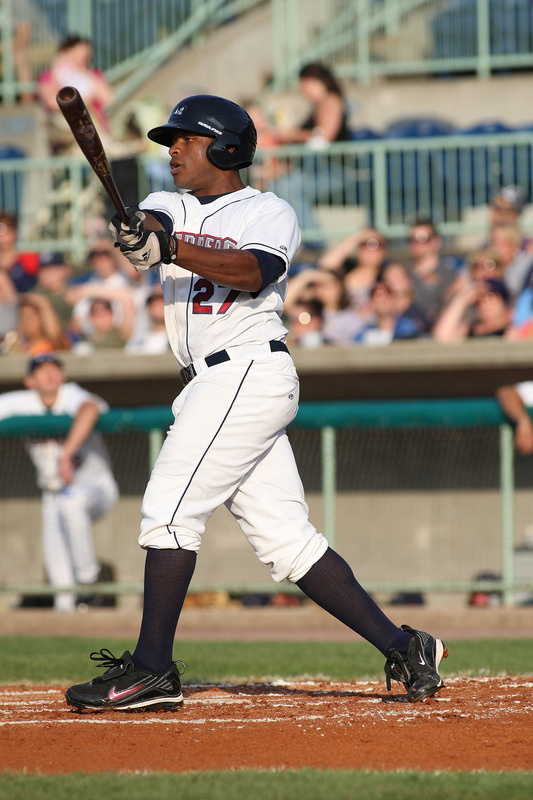 Candon was also drafted in 2011, six rounds after his older brother by the Pittsburgh Pirates. When Candon arrived at Eastwood Field at the end of August Bryson described his younger brother’s experience as “really fun. He said he had never spoken to so many fans in his life. They wanted to learn about him because they remembered me”. It is due to his relationship with Scrappers fans that makes the trip back to Mahoning Valley for the upcoming Hot Stove Banquet so special for Bryson Myles. “You always want to go back to where you first started, and Mahoning Valley was the start of my professional career. I think, to be honest, I may get a little emotional because I know once I get there I’m going to have little flashbacks. I’m excited and I can’t wait to see all the people and interact with all the fans”. Support. It’s taking the time to learn a player’s name. It’s staying late to say “good game” after extra innings. It’s a weekly phone call from a host family two years later just to check in. Above all, it’s showing someone that you care. Support is more then one word and two syllables, and it is what has helped 2011 Scrapper Bryson Myles build a foundation as a professional baseball player and become the Indians Organization All-Star that he is today.